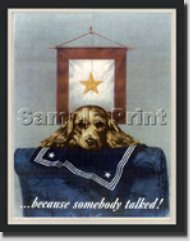 This reproduction depicts a great WWII vintage Navy poster. It simply states: Because somebody talked! A message meant to keep people from talking about secret operations. Canvas size is 8x10 ready for framing. You can add your own additional matte or leave it just as it is with the printed matte. These prints are made to order.